In the South West England, there is a town that is too pretty for words. It was founded in the 1st century AD by the Romans as a thermal spa (Aquae Sulis) and thus renamed Bath. It’s current form started in the 18th century, under in King George III. We must give thanks to the hard and inspired minds of John Woods the elder (1704-1754) and the younger (1728-1782), and their interpretation of Andrea Palladio’s (1508-1580) concept of picturesque aestheticism. We now see the seamless integration of the The Roman Baths and temple complex, the remains of the city of Aquae Sulis, and the more modern English City. Other architects and visionaries responsible for overall city landscape were Robert Adam , Thomas Baldwin and John Palmer. This Palladian bridge in the Prior Park Landscape Garden was built in 1755, and it is one of only four in the world. 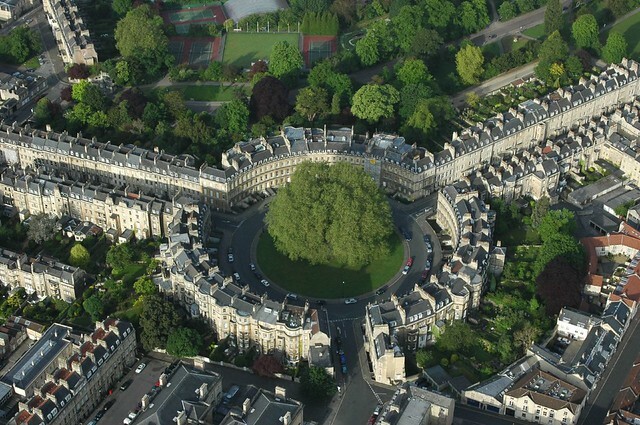 is set into a sweeping valley with magnificent views of the city of Bath. From ‘Obsession: John Wood and the Creation of Georgian Bath’, 2004, pp95-98). The (originally ‘Kings’) Circus (South Eastern Section – c1762-6) bathed in the late October sun of 2007, one of the best autums I can remember. As ever, the play of light across the beautiful Bath stone allows this shot to become magical! (Best viewed large size. )It has been pointed out that the Circus was originally devoid of any plants or grass, being a circle of cobbles, since Wood intended the link to nature to be a direct one-to-one relationship between the architecture and its symbolism and the open skies above – ‘a dramatic and theatrical space where the architecture took centre stage’. Wood believed that there had always existed a temple to the Sun and Moon on Lansdown hill and the Circus was to be his recreation of a temple of the Sun, with the Royal Cresent the reborn temple of the crescent moon! As such the Circus is the same internal diameter (318′) as Stone Henge, itself an ancient temple of the sun. We gathered together outside the stone ring at Avebury – it is the world’s oldest dating from between 2,500-2,600 BC)and one of the largest with a diameter of 331.6m – to experience a bit of druid magic. Surprisingly enough, we did. D.R. Harris & Co is a throwback to an Englishness that defined a nation. Established in 1790 this family-owned apothecary continues to produce the majority of their products using the same traditional methods. Being both hand-made and packed on the premisses just embues the aura even further. Amongst their diverse selection of products you can find – lavender water, soaps, colognes, bath and shaving preparations, skin lotions and aromatherapy oils, as well as body sponges, bone handled toothbrushes with bristle heads and – all sorts of little things that you just feel right acquiring – and a plus is they do not test on animals! You know you are shopping in the footsteps of giants as in 1938 D.R. Harris was granted the Royal Warrant as Chemists to Her Majesty Queen Elizabeth & the Queen Mother and in 2002 the warrant to HRH The Prince of Wales. Other Locations: Chancery Lane, Waterloo, Soho, The Gherkin and South Bank. The borough Market location (visited repeatedly) is just next to Monmouth coffee, the pairing couldn’t be more perfect. Once you know what delicacies reside inside, it is almost impossible to pass by without picking something up. ‘Konditor’ means pastry chef in German and pastry chef and creator Gerhard Jenne is German trained. This creates a wonderful combination of technique with british staples, evidenced, in what I feel confident to say, is the world’s foremost mince pie. Careful attention to ingredients – organic free-range eggs & natural butter – shows in the final product; a series of cookies, cakes, tartes, brownies and the lightest cheese-cake possible. There is also a selection of wheat free, dairy free and low sugar pastries, as well as personalized funky cakes. If you are in town for the holiday season, be sure to pick up as many as the aforementioned mince pies as possible. We purchased one of the Christmas Pudding’s and brought it to friends in Nepal for our visit; Tears of joy followed. There are savories as well, with daily lunch specials, sandwiches, salads, lasagna, and focaccias. If you have to have more, check out Chef Gerhard Jenne’s book~ Wacky Cakes & Kooky Cookies. Monmouth Coffee. Speak those two words to any coffee-lover who knows London and a soft smile will appear on their lips; a knowing glow in their eyes. Like most things these days, the earlier memories are the most pungent. For me us it was the cool afternoons ambling through Covent Garden, when suddenly your entire world would be filled with the singular aroma of roasting coffee; and then you would be dragged along by the nose till you found the source and stepped inside Monmouth Coffee! The 27 Monmouth Street, Covent Garden location first opened in 1978, where they used to roast the coffee in the basement (and thus leading to the corresponding scents drifting down the block). On the the mezzanine there are a few cramped wooden booths where you would crowd in with your caffeine craving brethren. Each of you tasting a roast from exotic locations: Yirgacheffe from Ethiopia, brews from the Colombian zona cafetera or organic beans from the Hawaiian islands – you can travel the world within your mug while snacking croissants and chocolates.